This month for Lazy Susan, we are celebrating things that we love. There is nothing that I love more than tiramisu. It is my favorite dessert in the world. I never made it at home because most of the recipes that I found called for raw egg. I know, the tiramisu that I was eating probably contained raw egg. But I didn’t know about it, therefore, it didn’t bother me. I am pleading ignorance. I discovered this recipe from a friend, and it truly is what I want for my last meal on this Earth. Layers of zabaglione, lady fingers, chocolate chips, and a boozy coffee mixture. The longer it chills, the better it tastes. This recipe is for sure a special occasion recipe. It calls for an absurd (not to mention expensive) amount of mascarpone cheese. But worth every calorie, and every dollar. When I was buying the ingredients for this tiramisu, I discovered that there is such thing as frozen ladyfingers. I had no idea that these existed. 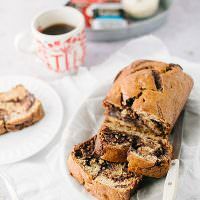 They are a little more cake-like, I have made this recipe a few times, and I prefer the kind that are more like biscotti. You can buy them in gourmet stores, Italian markets, online, and sometimes in the cookie section of the grocery store. I really like the addition of the chocolate chips. The one thing that I don’t like about tiramisu sometimes is that it has no texture. The mini chips add the perfect amount of crunch that I think this recipe needs. 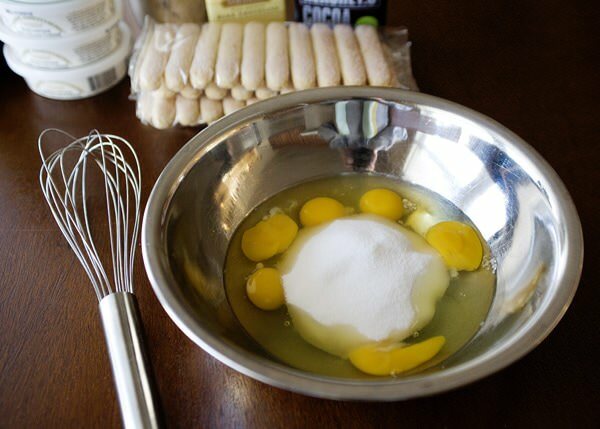 Whisk together the eggs and sugar in a large bowl. Or a double boiler if you have one, I don’t, so I just use a metal bowl. Put the boil over a pot of simmering water. 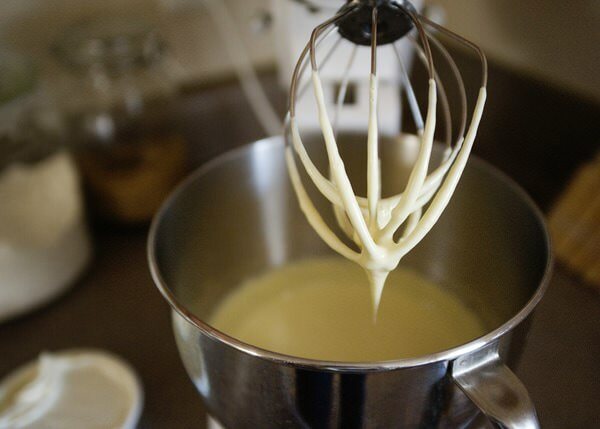 Whisk constantly until the eggs triple in volume and turn pale yellow. It takes about 5 minutes. 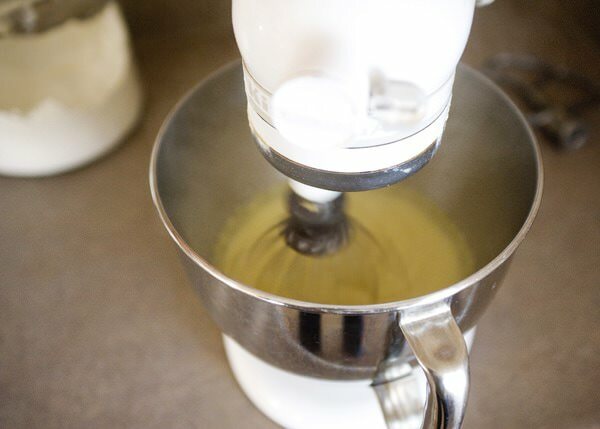 Now that I am reading this recipe again, it would have been smart of me to use the bowl of the mixer, instead of transferring it to the mixer bowl. Oops. Pour the eggs into the mixer and beat for about 5 minutes. The bowl will feel cool when it is ready. Add the mascarpone, one tub at a time until it is combined. Fold in the chocolate chips. Chill for at least one hour. In a large bowl, stir together the boiling water, brown sugar, espresso powder, cocoa powder and Kahlua. Stir until everything has dissolved. Set aside and let cool. 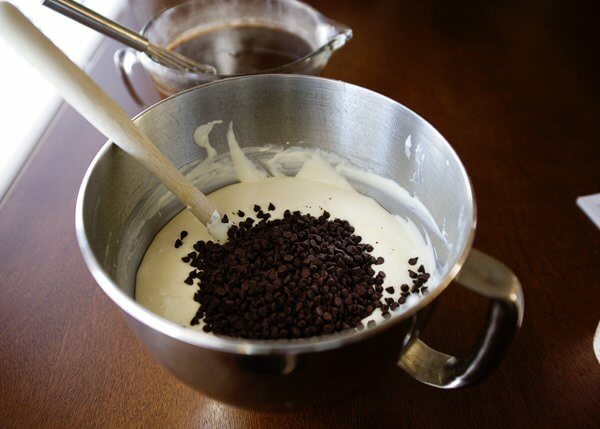 Pour the coffee mixture into a shallow dish. 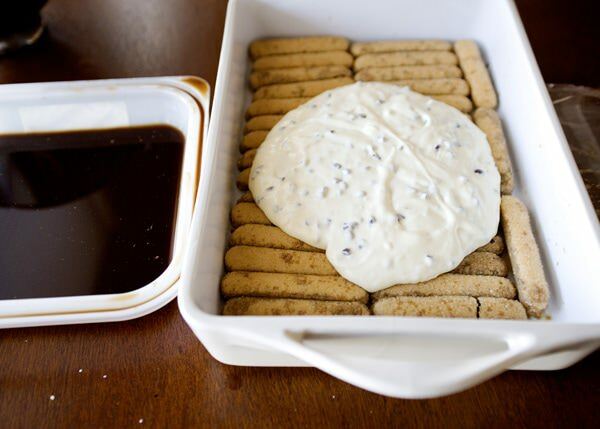 Dip the ladyfingers into the mixture, and line the bottom of a 9×13 pan with the cookies. You want the ladyfingers pretty wet, but not so wet that they fall apart. When I was done with my layer, I would brush more of the coffee mixture over each layer just to be sure that they were really soaked. Layer 1/3 of the mascarpone mixture over the ladyfingers. Repeat the layers until you have 3 layers of each. Alternate the direction of the cookies, it helps the tiramisu hold together when you cut it. Cover and chill for 2 hours. Overnight is even better. You can make this a few days ahead of time. Cover the top with shaved chocolate before serving. 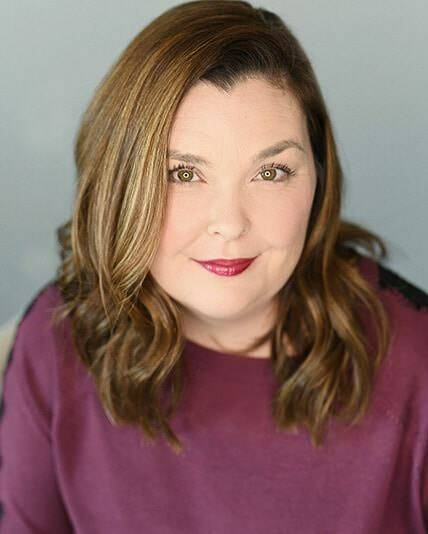 Next up, find out what Amy Boring loves. And while you are it, check out her gorgeous website called eat swell. Seriously beautiful. 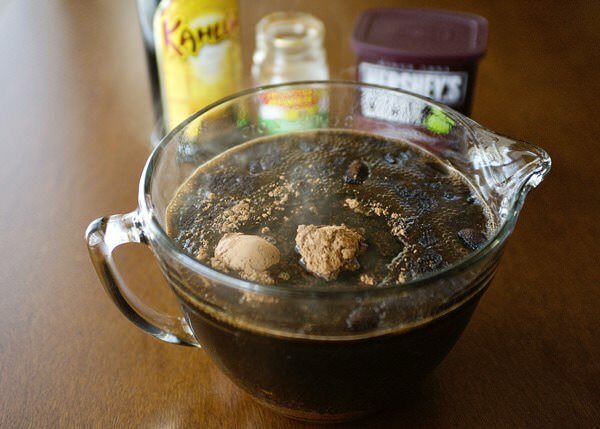 In a large bowl, stir together the boiling water, brown sugar, espresso powder, and Kahlua. Stir until everything has dissolved. Set aside and let cool. Pour the coffee mixture into a shallow dish. 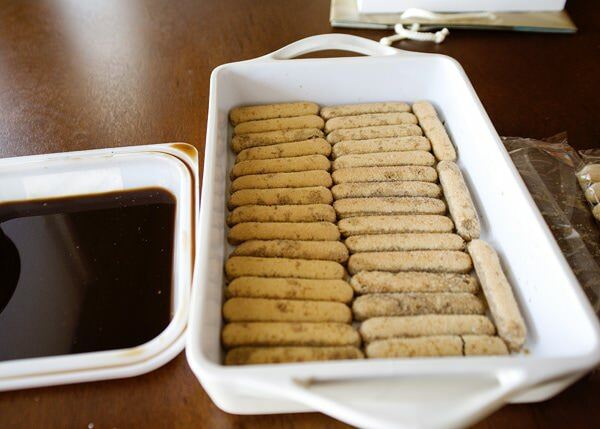 Dip the ladyfingers into the mixture, and line the bottom of a 9×13 pan with the cookies. Layer 1/3 of the mascarpone mixture over the ladyfingers. Repeat the layers until you have 3 layers of each. Alternate the direction of the cookies, it helps the tiramisu hold together when you cut it. Cover and chill for 2 hours. Overnight is even better. The longer is chills, the better it is. Mmmm delicious! I’ve been dying to make a tiramsiu cake and try using sponge cake for the layers. -although I don’t seem to have been finding the time to try it. Yours looks delightful! you can eat this version since it is all cooked! That is one seriously gorgeous desert Bree! I love tiramisu too!! Didn’t even know it had raw egg. I really don’t care because it’s so good. 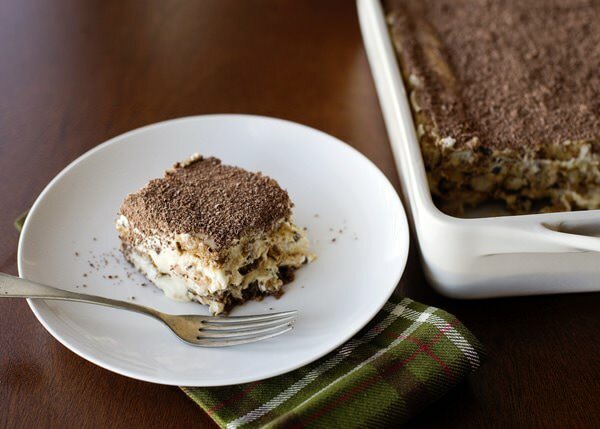 🙂 I’m going to make this dessert at some point, but it may be a while since no one else in my family likes tiramisu and I’d probably eat the whole entire pan myself! So I’ll have to bring this baby to a party! I’ve never been a huge tiramisu fan, but that could be because I’ve only ever eaten it out, and I think it was all from a frozen tiramisu. Definitely not the same as one made from scratch! I’m not a fan of tiramisù, but I am always fascinated by the process of making it. As always, your photos are lovely. You know you can make your own mascarpone for much cheaper than buying it, and it requires only 2 ingredients (cream/whole milk and lemon). I use the recipe from Baking Obsession blog (https://www.bakingobsession.com/2009/05/02/homemade-mascarpone-cheese/). It just grosses me out. I am sure that it is safe. But I had salmonella once in college and I am still scared. This looks delicious! 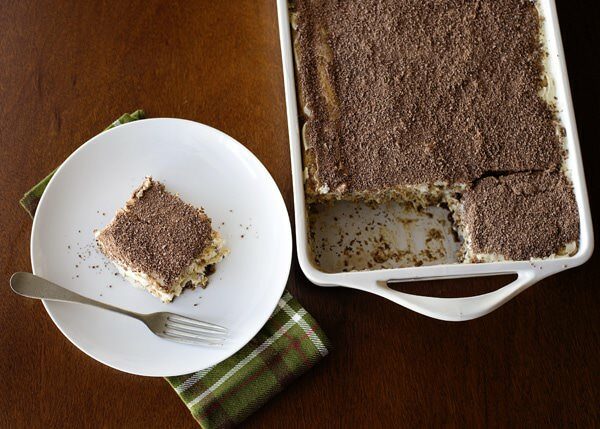 I haven’t had tiramisu in such a long time but now I can’t wait to have some for dessert! Oh, my, my, my! This looks AMAZING! My mother-in-law’s birthday party is this Saturday night. I’ll totally be making this for her birthday dessert! I love tiramisu is an understatement. This is gorgeous! You make that look sooo simple….and delicious! thanks so much for sharing this recipe. i am always on the look-out for a good tiramisu recipe. i love your recipes so i can’t wait to try this one!! Oooo That looks so delicious I think I might try that sometime! Yum this looks so good! How do you shave the chocolate bar so finely? 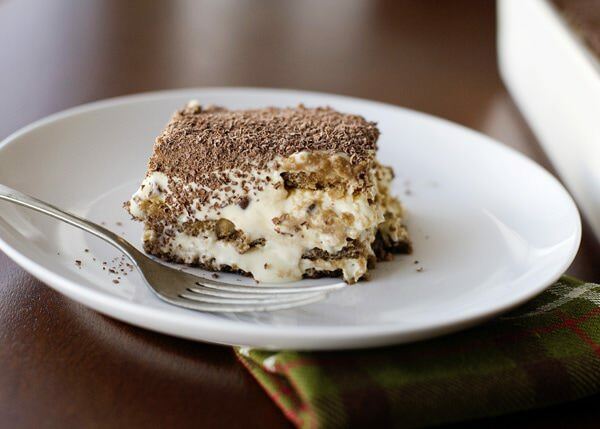 Oooooo… I LOVE tiramisu too. It is – by far – my favorite dessert when done RIGHT. And it looks like you’ve done it right! Gorgeous, and I’m sure delicious! This looks amazing! It is my husband’s favorite dessert so I will bookmark this recipe! Thank you for sharing the recipe, it looks amazing. Btw the ingredients mention cocoa powder, but i didn’t see where it was being used in the steps? thanks for letting me know. It goes into the dipping liquid. Putting the eggs in the double boiler over simmering water does not cook them. You are simply warming the eggs to loosen them and make the incorporation of air easier so that the mix is lighter and more flavorful. Even with this recipe you are still eating raw eggs. If they were actually cooked the end product would be chunky. It takes a temperature of 142 degrees F or higher to begin ti cook an egg and simmering water is at a max of 120 or so, which is not high enough to kill any bacteria or other pathogens. You can use cream cheese in place of the mascarpone as a cheap substitute and it tastes every bit as amazing. You don’t even need eggs in this version. I disagree, I do not think that cream cheese is as good here. 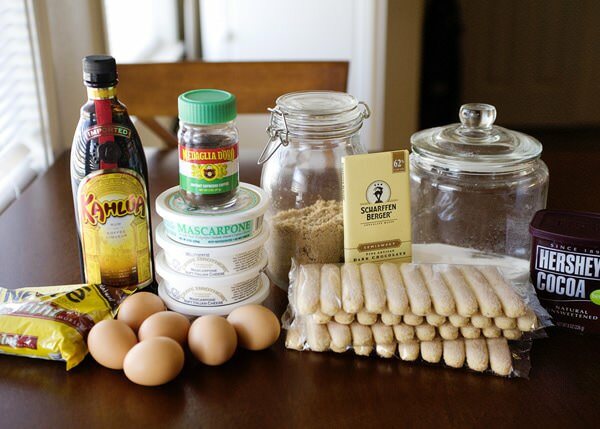 I think that if you are going to make a tiramisu you should make it the real way. Go get some and make this! Why thank you. This is the best recipe I have ever had. The crunch really gives it lots of texture and I love it. I love this recipe!! SO glad that you liked it so much too. Once again, a huge thanks for your recipes. I tried your Tiramisu recipe today and I couldn’t believe, but it was incredibly delicious. Thanks so much! I am so glad! Love this recipe. I love this recipe! It’s even more delicious then the Tiramisu I enjoyed in Italy. I’ve made this recipe three times now at different events and it’s a hit with everyone! Thanks for sharing! Wow! Thanks for the endorsement. My FAVORITE dessert ever. 1. You have an error! When you say to whisk together all the coffee ingredients (kahlua, coffee) you say to whisk in brown sugar when I assume it’s cocoa powder. 2. Apparently nowhere around here sells ladyfingers so I’m using waffle cookies. Should still be good though~ I’m adding extra chocolate chips for the lost texture. it’s also brown sugar. I don’t think that there is an error. I’m planning to try this for my boss’ birthday at the end of the month. I’ve never made tiramisu before. I’m confused about whisking the egg mixture. I don’t have a stand mixer. Should I whisk over the double boiler for 5 minutes, and then off the heat for another 5 minutes until cool? Or just combine over the double boiler, then take off the heat and whisk for 5 minutes? 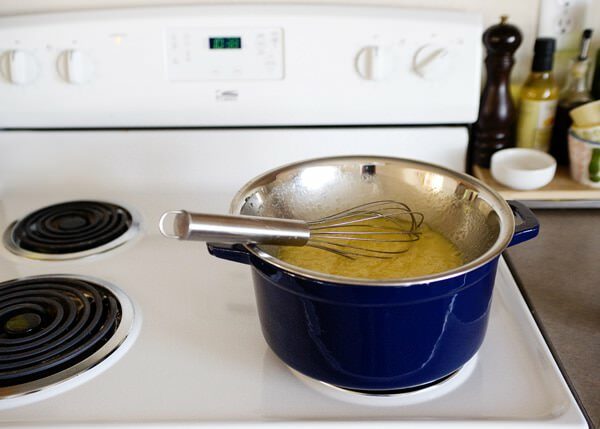 You cook over the double boiler to cook the eggs, then you whisk for volume. You want to whisk until they are thick and pale yellow. You whisk the whole time they are cooking otherwise they will scramble. 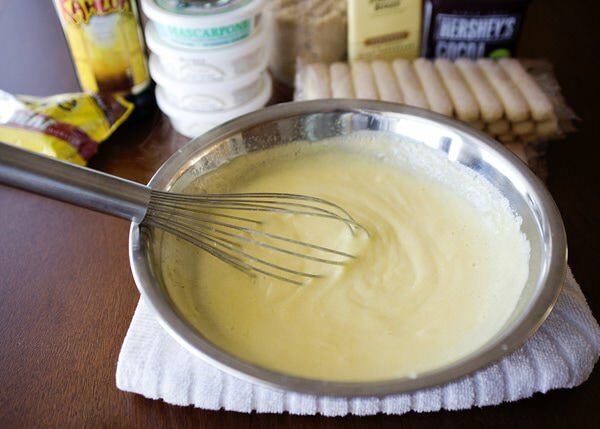 Follow the recipe as stated knowing that you will be whisking by hand and not using a mixer so it take longer.